Defense Secretary Mattis puts hold on Trump’s transgender military ban pending further review. Secretary of Defense Jim Mattis speaks during the press conference after meeting with Ukrainian President in Kiev on Thursday. Update, Aug. 30, 2017, at 2:42 p.m.: As Slate’s Mark Stern writes, Defense Secretary James Mattis’ Tuesday announcement was not necessarily the rebuke or freeze of Trump’s transgender ban that it was reported to be on Tuesday night. 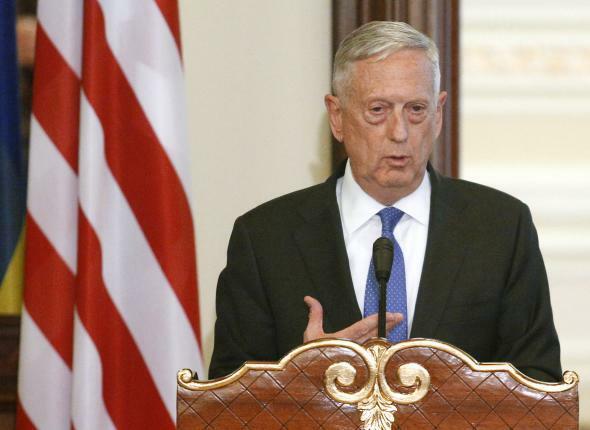 Original post: Defense Secretary Jim Mattis announced Tuesday the Pentagon will not carry out President Trump’s directive to ban transgender soldiers from serving in the military, opting instead to put a hold on the White House policy pending the findings of a formal expert study on the impact of the ban. Mattis’ move is a clear rebuke of Trump wrapped in professionalism. Trump announced the reinstatement of a ban on transgender individuals serving openly in the military with the flick of a tweet in July. The president of the United States provided no notice for the dramatic policy reversal—delivered via three tweets—and offered little by way of reasoning for why the ban was being put back in place.